In this increasingly mobile age, today's information technology places the Internet and all of the vast opportunities it represents at our fingertips on a daily basis. Getting connected is easier than it's ever been. As we've become more and more comfortable with the technology, we've seen it creeping into every aspect of our lives. Remarkably, every segment of the population—from the Baby Boomers to the so-called Always On generation (named because they are literally always connected)—has embraced the 'Net and relies upon it assiduously. One of the most rapidly emerging aspects of this digital reliance is in the area of online shopping. These days, it really is possible to touch a few buttons, input a credit card number, and buy virtually anything we want from virtually anywhere in the world. With Internet shopping, we visit a few sites, decide what we like, transfer it to a shopping cart and make the buy. Then, a day or two later, we get to tear open our package like Christmas morning. Now I'll be the first to admit I do love the convenience of online shopping for certain product categories. But, when it comes to buying diamonds—well, that's a different situation altogether. A diamond purchase is simply not one you should make sight unseen. Even professionals in the industry, when doing business with trusted associates and colleagues do not purchase anything they haven't held in their hands and seen with their own eyes. You'd think it'd be different. After all, there are a very limited number of diamond cutting centers in the world. With travel expenses being what they are, one would think the jewelry industry would have readily embraced the opportunity to save the time, money and expense associated with traveling to these centers and use the technology instead to buy and sell diamonds around the globe. At the wholesale level, diamonds are still purchased by professional buyers looking at each diamond with their eyes and touching them with their fingers. It's the only way to truly know what you're getting. Meanwhile, every day, on the retail side of this equation, you'll find wide-eyed and hopeful diamond shoppers eagerly spending their hard earned money—before they've even seen, let alone, touched the beauty (or, heaven forbid, the non-beauty) that came from the earth. Imagine if you would for a moment your response to the following line of conversation if it happened to you. Let's say you walk into a jewelry store and say to the person behind the counter; "Hi, I'd like very much to see a 1.00 carat round diamond". The person behind the counter smiles warmly and says, "Oh, of course, that's absolutely no problem. Please give me your credit card, I'll just charge $6000 against your account and when you come back in three to five days I'll show you your diamond." Well, that's exactly what happens every day on the Internet. Carat weight — This is the most commonly cited characteristic of any diamond. Bigger diamonds are usually worth more than smaller ones, because they’re more rare. But if a large diamond is poorly cut, has visible inclusions, or is not at least near colorless, it may be worth less than smaller but finer-quality diamonds. Many buyers consider a 1-carat-weight diamond the standard for engagement rings, but buying a larger ring is also common. Cut — Cut is extremely important and is most likely to affect the brilliance of the diamond. Don’t confuse cut with shape. Round, cushion, princess, oval and radiant monikers are all shapes, not cuts. Investing in a diamond with an excellent cut is often worth making a sacrifice in size. Color — Depending on what kind of diamond you’re planning to buy, color can be a good or bad thing. Traditional diamonds are worth more when they are colorless or near colorless. But colored diamonds — such as fancy or intense yellow diamonds — are even more rare. An untreated intense yellow diamond with excellent cut and clarity is worth well more than a colorless diamond of the same size. The highest grades of colorless diamond are D, E and F, with D ranking the highest. You don’t have to buy a colorless diamond to get one of high value, however. Clarity — The importance of clarity depends on the shape of the diamond. Emerald and asscher shapes require near-perfect clarity because even the smallest inclusions are visible to the naked eye. Other shapes, such as round and cushion, can sacrifice clarity for color. Typical clarity grades are IF (internally flawless), VVS and VS (very slight inclusions), and SI (slight inclusions). Fluorescence is another popular consideration that affects brilliance but it isn’t part of the 4Cs. Finding the ideal mix of these characteristics is one of the reasons seeing a diamond in person is absolutely essential. Online, all a shopper has to do is look at the merchant's Website, select the best-specifications they can find on a diamond at the price point they want to pay, and click buy it now. Then, the next day or worse, three to five days later, they get to see what they bought. It seems easy and fast, with no trip to the jewelry store required. Here's the rub though—it doesn't work like that—no two diamonds are the same. Even when two diamond certificates appear exactly the same. You have to compare diamonds in person, and especially when you plan to buy a diamond ring. Two descriptions on paper can be absolutely identical. Yet the diamonds they describe can look as different to the eye as night and day. This is why you can do a Web search on a 1.00 carat round brilliant cut diamond with H color and SI1 clarity, with an excellent cut and you'll find a plethora of diamond with prices ranging from $4900 to $6900 on the same website. Okay, you say, that one's easy. You just buy the most expensive one—it will be the best. No, it doesn't work that way either. Each and every diamond you'll ever see is as unique as two snowflakes. When you buy online like that, what you're really buying is a piece of paper certifying your diamond purchase falls within a certain set of parameters. But that certification has very little bearing on how the diamond will actually look on your loved ones' finger. It’s easy to find diamond information online. But it’s pretty clear that the best place to buy diamonds is in person — especially if you’re making a once-in-a-lifetime purchase like buying a diamond ring. Rings that have the same diamond grading don’t necessarily look the same. You need to buy diamonds in a place where you have access to the grading information on diamonds, as well as a place where you’ll get the satisfaction that comes from holding it up to a light and seeing it sparkle. When you buy diamond jewelry at Thom Duma Fine Jewelers, we’ll not only take the time to explain the most important characteristics of diamonds, but we’ll also help you choose the one you’ll love for years to come. It is our job at Thom Duma Fine Jewelers to educate you while we help you find the perfect diamond. We take the time to completely explain the 4 C's and why each one of these categories affects the price per carat. With this personal approach, we find out what is important to you so we can then help you select your ideal diamond from among 10 one-carat diamonds, rather than just one that looks right on the screen. You'll hold it, feel it, and personally examine it with all of the proper aids professionals use to supplement your natural eyes. Further, it's entirely risk free. The prices here in our store (for something you've actually held in your hand) are very competitive to those you'll find for the largely unquantified diamonds you'll find on the Internet. Best of all, at Thom Duma Fine Jewelers, we’re the only jewelry store that gives you a FREE Lifetime Bridal Warranty. At Thom Duma, you’ll never have to pay for an extra service plan. You’ll never have to pay for resizing and refinishing. You’ll never have to pay for tightening and other common diamond ring maintenance services. 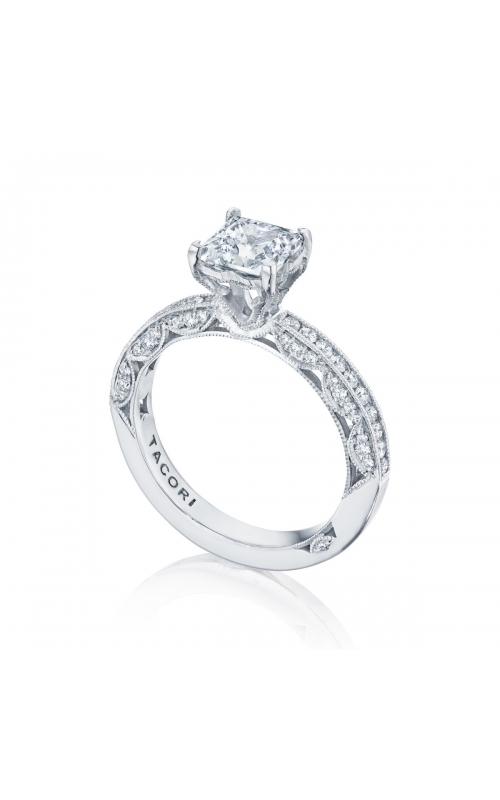 We’ll even replace a side diamond that separates from its setting absolutely free. No other jeweler offers this LIFETIME warranty. Before you get roped into the questionable idea of shopping for a diamond online, visit or call Thom Duma Fine Jewelers. We guarantee you both an education and a highly pleasurable shopping experience you will never forget. Apples to apples, diamond for diamond, no one will sell you a comparable diamond for less.